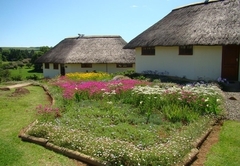 Otters Den is a highly recommended property providing self catering in Nottingham Road for tourists visiting the Natal Midlands region. 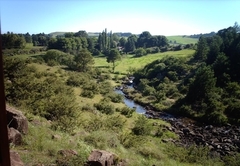 Otters Den offers four secluded, self-catering cottages set in 18 acres of unspoilt countryside in the heart of the arts and crafts route of the Midlands Meander. 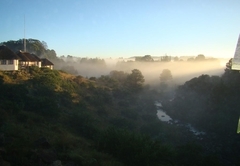 Built in 2004, these well-equipped cottages overlook the Lions River near Nottingham Road in Kwazulu Natal, offering a truly peaceful and relaxing break away. French is also spoken. 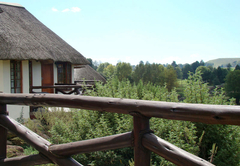 We have 4 freestanding newly built thatched cottages: Chelsea, The Great Western, Ikhwela and Copper, each with a private balcony overlooking the Lions River. Copper Cottage is our romantic open planned honeymoon suite with its own private river view jacuzzi spa bath, situated at the foot of a queen-sized double bed. Every cottage also comes with a welcome pack including tea, coffee, sugar, milk and delicious home-made biscuits. 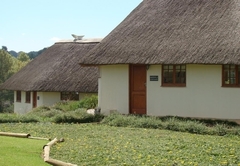 Each of our cottages is for 2 people and has an ensuite bathroom with its own jacuzzi spa bath. 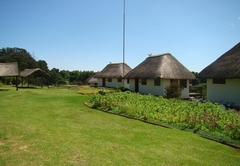 Every cottage also comes with a fully equipped kitchen including microwave, 2 plate stove, fridge/freezer, toaster, and weber braai. They all have dining and lounge areas, a table and chairs on the balcony as well as a queen sized double bed and private car port. 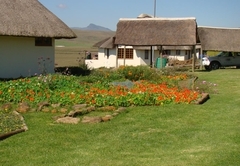 For cold nights our cottages also have an electric fire and electric blanket with goose down duvets. 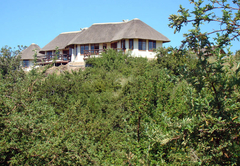 All utensils, crockery and glasses are included and all linen and towels are supplied. 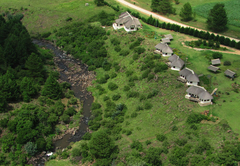 Otters Den Self Catering runs alongside the Lions River providing beautiful views as well as the opportunity for gentle riverside walks or swimming in the crystal clear river pools. 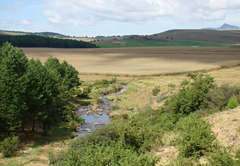 We are situated on the glorious Midlands Meander arts and crafts route, offering various local products and produce. You could also bring your bikes and ride in the scenic countryside. 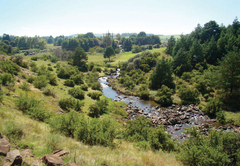 The local area abounds with things to see and do including trout and bass fishing, golfing within a 10 minute drive and the renowned Midmar Mile at Midmar Dam. 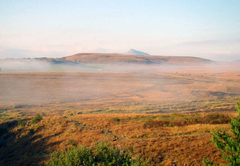 The historic battlefields route can be found approximately 1 hours drive away and the well known world heritage site of the Drakensberg mountain range is also about 1 hours drive away. There are numerous restaurants within 15 minutes drive including Rawdons Hotel and Nottingham Road Hotel to name but a few. The home of the Midlands local brewery is situated in Nottingham Road at Rawdons Hotel. 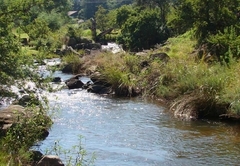 We are located 13km out of Nottingham Road village, on the Fort Nottingham Road in the heart of the Midlands Meander arts and crafts route. 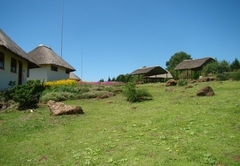 Only 50km from Howick which is famous for the Howick Falls, 70km from Pietermaritzburg a historic city and 1 1/2 hours from Durban International Airport. We are also 450km from Johannesburg. 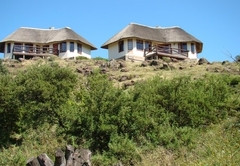 Each cottage has its own jacuzzi spa bath en-suite, private balcony with river/valley view, a queen size bed with goose down duvets and is fully furnished including a weber braai. 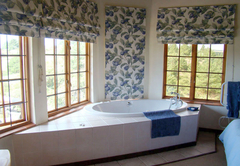 Each of our cottages is for 2 people and has an en-suite bathroom with its own jacuzzi spa bath. Every cottage also comes with a fully equipped kitchen including microwave, 2 plate stove, fridge/freezer, toaster, and weber braai. They all have dining and lounge areas, a table and chairs on the balcony as well as a queen sized double bed and private car port. 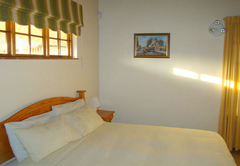 For cold nights our cottages also have an electric fire and electric blanket with goose down duvets. All utensils, crockery and glasses are included and all linen and towels are supplied. 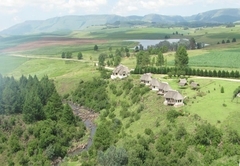 Truely a magical little place, perched above the babbling Lions river and rolling Midlands country side. Everything you could need for a comfortably cosy stay. I will be back again for sure.